Fleetwood Tucked Valance by Stylemaster is a Colburn Clone, it features a multi color small scale checker/dot pattern. Swags Galore, specializes in finding low cost alternative. The Fleetwood Tucked Valance is an elegant designed valance. For proper fullness use approx two to three times your window width in fabric. For wider windows use multiple valances. The fuller the better, when it comes to tucked valances. Swag Sets, Straigt Valance & panels also available. Fabirc: 53% Rayon, 47% Polyester, washable. Love them got all this window treatment from Swags Galore. well made and looks very nice! I get alot of nice complements. I will buy from your company again! Thank you! I had been looking for some country curtains for my home for some time, I came across your site and thought I would give it a try. The curtains I purchased were better then I had expected so i ordered more.Love Love Love them, I got the look i was wanting! I will be doing business with you in the future. Iâ€™m very happy with my order. I first ordered these valances from another company years ago. I loved them so much that when we moved and I had to leave them with the old house, I searched online specifically for these same ones. I am so glad I found them on your site as the original site no longer carries them. You made my day. These hang really well and suit my style. I've washed them many times and they still look new! Have been looking on line for a long time for a nice, affordable tucked valance for my tv room. Found it with Fleetwood. I am completely satisfied with my purchase, service and fast delivery. I will order again. This curtain will go in my kitchen and will replace my blinds. I wanted something that would look good, let enough light in by day and while private by night. Spot on! Very happy. ProsQuality curtain for the price. Great look. I ordered two of the Fleetwood Tucked Valances for my extra-wide Kitchen window. They drape beautifully and I have received many compliments on how they look. I love these curtains...color is beautiful and well made...great buying experience from Swagsgalore! I'm very pleased with these valances. The style, workmanship & value were very good. Beautiful and very well priced! 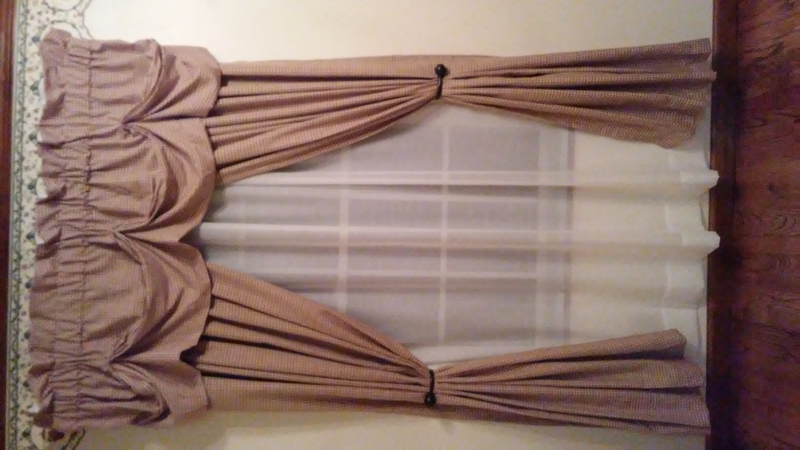 These valances look great and are priced better than any comparable product online. I would totally recommend this site! Quality valance, looks great in my kitchen. I love the colors and the texture of the valance. I ordered theses curtains on a Wednesday and they arrived the very next day! I couldn't be more pleased. The curtains hang beautifully and although I was keeping my fingers crossed regarding the colors, as they were a bit hard to distinguish on screen, they are a lovely blend of muted greens,tans, and reds. ConsNeed to be ironed, so if you don't own an iron, these curtains are not for you. I love my curtains, I got my order really fast and I have looked everywhere and this is the best! They look great, I love them. Love! You can't beat the quality and look for the price. I ordered 3 valances for my living room window which is about 7 ft. wide. They look great on the window and in the room. My couch is placed in front of the window and the valances compliment the couch and other furniture. I pressed the tops and bottoms of the valances with my steam iron on a light fabric setting but made sure not to press the pleats in the tucked areas. Really like these! Because they were just too "heavy" looking for my areas.